A Cam Newton personal appearance, Cam Newton speaking engagement, or Cam Newton endorsement will reflect well on your company. To hire Cam Newton now for any corporate appearance, fundraiser, motivational speaker event, personal appearance, autograph signing, or website endorsement please contact our celebrity agents at 1-877-6-SPORTS. We will contact Cam Newton or contact Cam Newton's agent and provide you with the booking fees and availability immediately upon your request. Direct Sportslink is the only sports speakers bureau and talent booking agency based in the United States securing only sports talent for corporations, associations, and organizations for motivational speaking engagements, personal appearances, and endorsements. We are the premier sports celebrity booking agency and a sports celebrity procurement expert. Accordingly, we will provide you with any relevant Cam Newton website information and booking agent details so that you can hire Cam Newton for your next event. 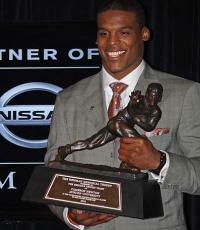 Cam Newton was initially a member of the Florida Gators before transferring to Blinn College and later to Auburn University. He became just the third player in major college history to both rush and pass for 20 or more touchdownds in a single season. 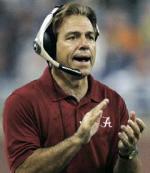 In 2011 he won the Heisman Trophy and led Auburn to their second national championship in school history. 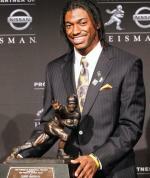 He was later ther first overall pick in the 2011 NFL Draft by the Carolina Panthers. Newton became the third player in history to be awarded the Heisman Trophy, win a national championship, and be the first overall pick in the NFL draft all in the same one year span. In his NFL debut, Newton became the first rookie quarterback in NFL history to throw for 400 yards in his NFL regular season opener. He was named the AP Offensive Rookie of the Year, the Pepsi NFL Rookie of the Year, the Sporting News Rookie of the Year, and was named to the Pro Bowl. Based on your interest in Cam Newton as a speaker or for a personal appearance, Direct Sportslink has provided you additional links below for other sports talent with similar appearance fees, speaker topics, and categories that match Cam Newton.